“My coaching philosophy is based on what I learned as a player and what drove me as a player – and that’s finding space on a rugby field." Space is a commodity in short supply in the modern professional game, particularly in the structured parts of the game close to set-piece. How do you find the spaces which Townsend claims are always there, at times when the defence is still likely to be cohesive and well-organized? The answer to that question is connected to the issue of ‘reloading’. How do players from both sides reposition themselves after a stopping point in play (a ruck or breakdown)? How hard do they work to find a new space in which to attack or defend, and how accurately do they regroup? How determined are they to make that second effort? 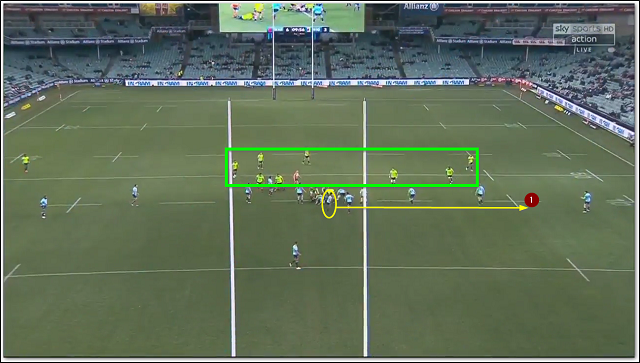 The recent Super Rugby quarter final between the Waratahs and Highlanders in Sydney contained two excellent examples of how to exploit re-positionings after a ruck has been formed. Both examples derived from four-phase attacks with a lineout starter. The first instance occurred in the 10th minute of the match, from a Highlanders throw right on halfway. On 1st phase the Highlanders set a straightforward midfield target off a run by their centre Rob Thompson, following it up with a short pick and go off the base by number 8 Luke Whitelock. Perhaps the only small hint of trouble to come is the movement of the Highlanders’ number 7 James Lentjes, reloading back to the opposite side to Beale underneath Naholo. On 3rd phase, the whole complexion of play changes dramatically. 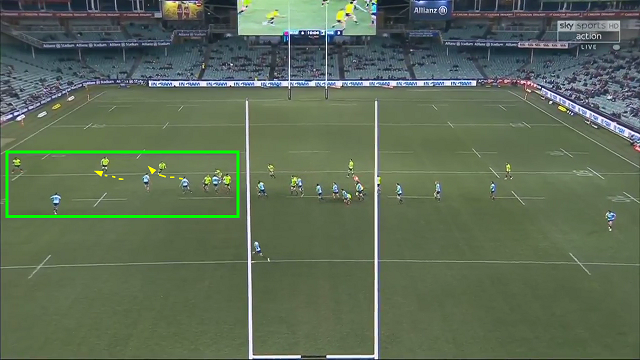 On defence, three Waratahs have been consumed at the tackle while one other forward wraps around to the Beale side. The defensive sweeper (Tahs scrum-half Nick Phipps) also drifts out the same way. With Bernard Foley drifting out too far, Sopoaga is able to take the gap underneath him and set up the scoring opportunity for Naholo. On the Highlanders left meanwhile, there are only two attackers left facing five unemployed Waratah defenders! The success of the sequence is mainly due to contrasting reads and reloads on both sides of the ball. 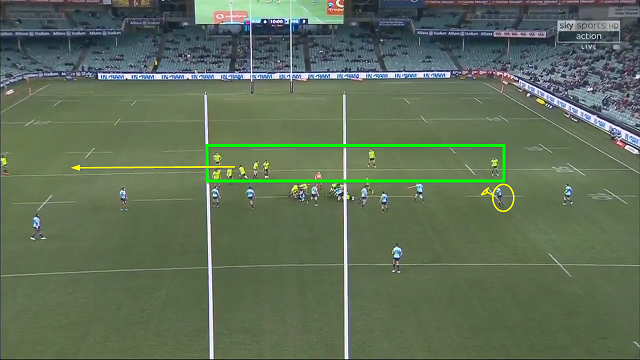 The Waratahs read an attack over their right side and regroup in that area, when the Highlanders’ chief play-maker Lima Sopoaga has shifted in the opposite direction. It is crucially, the repositioning work done by Lentjes and Walden off the ball which makes Sopoaga’s decision count for a full seven points. 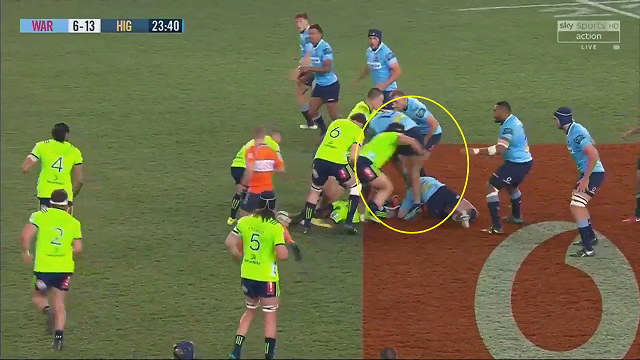 At this stage, play is located over on the Waratahs’ right 15 metre line, and there is a question about why Rona is the man making the tackle in this situation. Typically he would regroup to the open-side of the field to provide cover in the wide channels, and leave the forwards to tackle their opposite numbers. 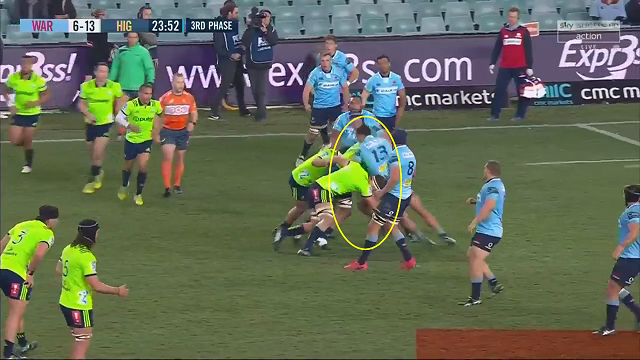 With Rona out of play and Kurtley Beale also defending near the ruck, the Waratahs have only Foley and left wing Taquele Naiyaravoro left to defend a full Highlander back-line plus Lentjes in his customary spot inside Naholo, and it is not nearly enough. How quickly can we identify the space, and reload to exploit it on attack? That is the key question for the offence, especially when play is relatively structured. How accurately can we read opposing intentions, and regroup on the right side of the ruck after one phase ends, and before another begins? That is the key question for the defence. There are a succession of efforts and choices to be made on both sides of the ball. It is partly a matter of counting numbers, but more importantly a matter of getting the right bodies in the right place to perform their core duties.